Every studio that comes to The Power of Dance is asked to designate a charity or cause that they would like to support. For every group number and duo/trio entered, $10 will be donated to your charity. $5 will be donated for every solo entered. Every first place Overall GROUP winner (Small Groups, Large Groups, Lines and Productions) wins an extra $10 for your cause. $10 of the $30 Title Entry Fee, for EVERY Title entry, goes to your cause. We also hold a POSTER CONTEST at each event. Make a poster, banner or display about your cause, and the winner gets and extra $100 for their charity. This is a great way to get the kids in the spirit of things, and we've seen some amazingly creative displays. We usually name more than one poster winner during the weekend. Venues often do not want us to tape the posters to their walls, so please try to use firm foam board or something that may lean on a wall if possible. You may also make a display that stands up by itself, of course. Each studio’s designated charity must be recognized by the Internal Revenue Service as a not-for-profit organization. Donations may NOT go to an individual. If you’d like to help an individual, such as a child in need of medical care, The Power of Dance may only donate to a foundation or non-profit set up to benefit that individual. Since the purpose of our event is to help others through our art, organizations whose purpose is to support a dance studio or dance company are not eligible, even though they may have been granted non-profit status. We want the kids helping OTHERS, not themselves. Kind of the whole point. Entries are accepted on a first come/first served basis, and are limited to performance time available. The Power of Dance reserves the right to add additional competition days or move the competition location if necessary. Independent entrees are not accepted. Registration is on line. Please see our registration page for details. You may edit, add or delete entries until we lock the event. You will receive an email a day or two before that happens, encouraging you to check your entries for accuracy. Schedules are normally posted in the registration system on the Wednesday of the week before the event. (Nine days before the event, not two days before.) NO CHANGES WILL BE PERMITTED AT THE COMPETITION. There will be a service charge of $30.00 for any check returned by a bank for any reason, and all future payments from that individual or studio will have to be in the form of a money order, cashier’s check or credit card. If payment has not been received by the competition date, the dancer(s) will not be allowed to perform. No refunds will be made for any reason. Credits for future competitions will be issued only for medically excused dancers. Studio Owners must select the appropriate division for each dancer, and the level a dancer is placed in will follow through to every dance that he or she is in. The Shining Star Division is for dancers who take 3 or fewer hours of dance per week and have limited or no competition experience. A Shining Star dancer may compete in no more than one solo and five group dances. (NO Super Star dancers may compete in group dances in this division. The presence of even one Super Star dancer will cause a Shining Star entry to automatically be bumped up to All Star.) All Star is for dancers who take between 3 and 5 hours of dance per week. A dancer in this division may compete in no more than two solos and no more than 8 group dances. All Star dancers may compete in group dances in both the Shining Star and Super Star divisions. Super Star is for dancers who take 5 or more hours of dance per week. There is no limit as to how many dance they may appear in, but remember that no Superstar level dancer may appear in a Shining Star entry. Placement should be made based on the highest recent level of training. If an older dancer goes from dancing ten hours a week to only taking tap one hour per week and doing a tap solo, they would still enter as Superstar, not Shining Star! Dancers may compete UP in division, but not down. In other words, we do not REQUIRE those dancing less than three hours a week to enter the Shining Star Division – it is the studio’s option. But those dancing 4 hours per week may NOT enter as Shining Star. If the judges feel that a piece is obviously placed in the wrong division, they have the right to move it as they see fit. For dances that include dancers from more than one Division, the dance will be placed in the Division in which the most dancers in the entry are placed. If the split is even, they will be placed in the higher Division. (A Duo with one Shining Star Dancer and one All Star Dancer would be placed in All Star, for example.) Studios may opt to place a dance in a Division higher than the one calculated by the system, but they may not compete down a level. The Soaring Star Division is a very special program for Special Needs Dancers. We invite any studios with Special Needs students of any sort to share our stage, free of charge. We know from personal experience that these dancers share the joy of dance as passionately as anyone can, and we are honored to allow them to share that passion with us. 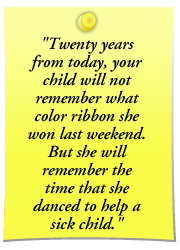 The entire point of The Power of Dance is to encourage children to use their gifts to help others. This category fits that vision perfectly, for when we’ve had special needs groups perform with us in the past, THEY have truly helped US -- our staff, the judges, the other performers, and everyone in the audience. No one, anywhere, has ever seen a truer expression of the power of dance, and none will soon forget it. There are no rules -- we leave it up to the teachers and parents to tell us what accommodations are needed. Dances may be announced simply as "For Performance Only" if so desired. The Adult Division is self-explanatory. The dance CAN be a mixture of parents and students, but if there are any adults in a piece at all, (Ages 20 and up) it will be placed in the Adult Division. TIME LIMITS: We do not have time limits. Why? Well, at the request of several studios, we had added the "extended time" option. But this left a bad taste in our mouths -- you should not be able to PAY to break a rule! What's next, $10 per extra "trick"? It has worked well so far, and as long as studios do not start showing up with ten minute solos, we'll keep with it! Age Cut Off: For both Regionals and Nationals, dancers are placed by their age as of January 1 of that season. For group dances, ages are averaged and anything to the right of the decimal point is dropped. Age Bump Rule: For Duos, Trios, Small Groups and Large Groups that include dancers from different age groups, the entry will be placed by our system one age group beneath the age group of the oldest dancer in the entry, regardless of the avarage age of the dance. For Lines and Productions, which often include all dancers from a studio, age is determined by averaging the ages of all particpants in the dance. We know that these dances often include every dancer from a studio, and applying a "bump rule" would often cause those entries to be scheduled much too late at night for your 5 year olds! Any dance that includes a performer 20 years or older is placed in the Adult division. If a question should arise concerning the age of a contestant, a birth certificate must be provided at the competition as proof of age. All protests must be presented in writing within 30 minutes of the incident to the competition director. Ballet – A dance consisting of classical steps and ballet technique. Character – A dance in which an easily recognizable character is portrayed throughout. You may incorporate any form of dance, including acrobatics tricks or tumbling passes, but not more than 50% of the dance may be acrobatics. Clogging – A dance performed in clogging shoes using clogging technique. Contemporary – Lyrical or jazz movement infused with elements of modern. Hip Hop - A dance which consists of the latest “street” dance styles, including funk, break, popping or any other terms they have made up by the time you read this! Jazz – A dance consisting of classical jazz technique. Lyrical – A dance that is interpretive in nature and features contemporary lyrical styles demonstrating balance, extension, isolations, and control. Modern – A dance consisting of modern technique such as Graham, Horton or Limon. Musical Theater - A piece featuring any style of dance interpreting a song from a “Broadway” or movie musical. Open - This category is for any routine which falls into any of our performance categories, or any combination thereof, or any style of dance. Pointe – A dance consisting of classical ballet technique wearing pointe shoes. Pom Pon – Pom Pons must be used for at least 50% of the piece. Vocal - Routine may be any type of vocal presentation. Accompaniment must be on tape. No lead vocals permitted on tape, backup voices only will be permitted. Prizes are awarded to the Dance Studio in the form of a Gift Certificate for the following season. Your routine must be completed to be eligible for overall awards, and you MUST perform within or before your award session. We will announce overall second through 10th place winners in each category and age division. There will also be special judges awards and choreography awards, as well as various awards recognizing choreography, artistry, showmanship, technique and entertainment value. Four students (One each of Junior, Tween, Teen and Senior) will each be awarded a $500 Scholarship to The Hollywood Summer Tour, which usually includes attendance of a filming of "So You Think You Can Dance!" This award usually goes to the highest scoring jazz or hip hop solo. Two seniors will be Awarded $100 Scholarships to Broadway Dance Center in New York City, and several dancers will be awarded scholarships to Soar, our dance convention held in the fall and winter. We will select "Mr. & Miss Power of Dance" Winners in each age group and Division, who will be selected based on a solo along with an essay or paragraph about their charity -- what it means to them, why it was chosen, or whatever they would care to say on the subject. These are not scored or graded in any way, we just need to see that some that some thought and effort were put into it. We will not consider our own opinions of the merits of a dancer's chosen cause. Essays may or may not be shared with the judges. They love to read them, but there are often too many entries for them read during the event, and the essay itself in no way affects the score. Title entrants all win an extra $10 for their cause. The manner and method of judging will be solely within the discretion of the judging panel. Each routine will receive a video critique from each judge. Awards are based on placement within your category and age group. No Tricks or Acro Passes are Allowed in, Ballet, Pointe, Vocal. Three Tricks Allowed: (But no Tumbling Passes, as tricks should be incorporated into choreography) Tap, Jazz, Modern, Lyrical and Contemporary. Unlimited Tricks Allowed: Acrobatic, Open, Hip-Hop, Musical Theatre, Pom Pon and Character. If your whole group is doing an acrobatic trick in unison, it will be counted as one trick. Videotaping – See “General Rule” #2 below. Un-sportsmanlike behavior – See “General Rule” #5 below. “Run-offs” or incomplete routines will be allowed a second attempt, but this will be for adjudication only and the routine will not be eligible for High Score Awards. Challenges – Any studio wishing to challenge a dance based on number of tricks, possible participation of teachers or professionals, or any other rule violation must bring their complaint to the Event Director within 30 minutes of the end of the dance in question. 1. Smoking is prohibited at all events sponsored by The Power of Dance. Also, food & drink is forbidden in all auditoriums and theatres. We are guests at each location, after all. Studio Owners, please make your families aware of this rule, as well as those below. 2. Video taping, movie cameras, cameras and cell phones are forbidden in the performance area and dressing rooms! If any cameras or video equipment are seen in use in the competition auditorium, the dance will be stopped and The Power of Dance reserves the right to erase the contents of the media being used and remove the person involved from the auditorium. Repeat offenses may result in studio disqualification. Our wish is to protect not only the work of the choreographers, but, first and foremost, our children. After all, we have no way of knowing if the person filming is someone who SHOULD be filming that dancer or is in fact a complete stranger. And since cameras and cell phones can now be used to film, they must be banned as well. STUDIO OWNERS – You must make all of your parents aware of this rule. 3. By entering this competition, all dancers give their permission to The Power of Dance to use their photographs or video in connection with advertising, promotions or news coverage of our competitions without further authorization or compensation. We will not identify any dancer by name without written permission from that dancer’s parent or guardian. All dancers should be advised by their Studio Owners that the event may be videotaped. Those not wishing to be to be videotaped have the option of not performing, but there will be no refunds. 4. Freestanding props are permitted, but live animals, fire, pyrotechnics of any kind, swords, knives, and guns are all forbidden. Use of any may result in the disqualification of that dance. No fog machines or extra lighting or sound equipment will be allowed either. 5. Sportsmanlike behavior is expected at all times. Failure to display proper decorum by any student, parent or teacher, either in the auditorium, dressing room, or any other location, could result in immediate disqualification and dismissal from the premises with no refunds issued. 6. The Power of Dance strives to be a family-oriented competition, and any dance that is overtly sexual or lewd in nature, promotes violence or bigotry, or includes inappropriately revealing costumes may be scored down at the discretion of the judges. 7. We encourage you to send your music to us before the event via dropbox or through our registration system. Each contestant may also furnish his/her music on ipod, flash drive or CD. Music must be properly labeled with title of song, studio, and the dance’s designated number. A backup is recommended. Some downloaded CDs occasionally fail to play on certain sound systems. All CDs must be given to the sound engineer BEFORE the start of the session in which the dance is scheduled. We strongly encourage that all music be sent to us BEFORE the event, since songs in the compueter rarely have any issues. 8. Any questions regarding routines should be brought to the attention of the show director by teacher or studio director only. 9. No one will be allowed to perform out of order except when there is a costume change issue, which must be verified by the director or stage manager. We attempt to schedule at least 10 minutes between each performers dances for costume changes. Performers must be ready to perform when their number is called. Please be prepared to perform one hour before your scheduled time in the event that we run ahead of schedule. If performers are not backstage when their dance is called, and the stage manager has not been notified a warning will be issued. Repeat offenses will result in disqualification of dances. This rule is not aimed at forcing quick costume changes -- it is aimed at studios that choose to have their dancers rehearsing in the hallways when they are supposed to be on stage! 10. The Power of Dance and the hosting facility are not responsible for personal injury or loss.